The FIT Museum (Fashion Institute of Technology) in New York City recently mounted a small, studious exhibition honoring one of the most influential fashion designers of the 20th century. Adrian. Sometimes known as Gilbert Adrian, he was born Adrian Adolph Greenburg in 1903. He created costumes for over 250 films for Metro-Goldwyn-Mayer, the Hollywood studio known for extravagant glamour. From the late 1920s to 1941, Adrian dressed Garbo, Joan Crawford, Jean Harlow, Myrna Loy, Greer Garson and more, the stars whose fashion images were envied and copied by women everywhere. The exhibition, though concise, very neatly pinned down what made Adrian great. It was his love of textiles. He, himself, dedicated his final collection in 1952 to “the beauty and integrity of fabric.” Displays in the narrow gallery are devoted to appliqué, draping, inset, mitering, piecing, tailoring and screenprinting. Adrian was a master of them all. The hallway display opens up to a small gallery where a dozen creations are displayed on mannequins which demonstrate Adrian’s innate ability to mix drama with glamour executed with the height of talent, taste and craftsmanship. The exhibition, “Adrian, Hollywood and Beyond” enjoyed an unfortunately short-lived three-week appearance at the FIT Museum, Seventh Avenue at 27th Street, NYC. The Museum at FIT (Fashion Institute of Technology) in New York City has once again mounted an exhibition that engages the intellect as well as the eye. Educational and entertaining, “Paris Refashioned” has been curated to clearly demonstrate an important turning point in 20th century fashion history. 1957 to 1968 marks a shift in style that changed the look and the attitude of French high fashion dictating decrees blindly obeyed. As always, big fashion changes reflect a big change sociologically. Blame it on the youth and specifically blame it on the rebellious post-war English baby boomers who simply refused to follow in their parents’ footsteps, especially about fashion. Swinging London became fashion’s epi-center and the stuck-up grandeur of Haute Couture was left out in the cold. Some designers, notably Cristobal Balenciaga, just refused to join in the Youthquake-inspired fun. A new, youthful generation of designers (Yves Saint Laurent, Givenchy, Cardin, and especially Courrèges) continued to create Haute Couture, but in a fresh, younger spirit. When YSL opened his Rive Gauche ready-to-wear boutique, the French experienced another revolution, minus the guillotine. The FIT exhibition is divided into two distinctly different galleries. First, a display of the Old Guard attitude, elegant and mature, the last vestiges of the rigid ripple-out system. The second gallery is like a breath of fresh air, displaying designs by “stylistes” like Karl Lagerfeld, Emmanuelle Khanh, Emanuel Ungaro, Sonia Rykiel, Paco Rabanne, and more. “Paris Refashioned” ended April 15 at The Museum at FIT, Seventh Avenue at 27th Street, New York City. Liz Taylor Again and Again! 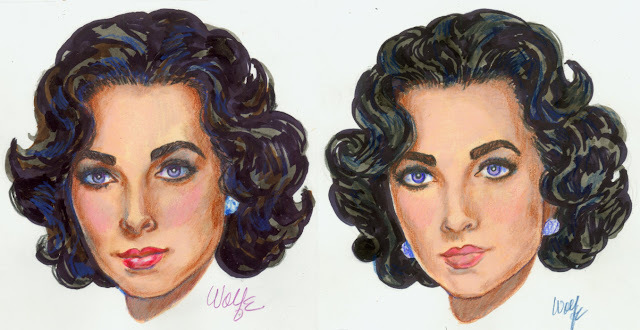 I was thrilled when Jenny asked me to create a Liz Taylor Dress-a-Doll for a future issue of Paper Doll Studio magazine. The issue is planned as a tribute to the truly mythic movie star. Immediately, I thought the Dress-a-Doll Liz should be wearing a lace trimmed slip to recall her iconic lingerie image widely used to promote Cat on a Hot Tin Roof and Butterfield 8. But Jenny and I had to put our heads together to get the best image…not too young, not too old. And what about her hair-do? A sleek coif would mean artists could devise wigs but wigs are a big challenge so we decided that it would be best to give the doll a fluffy-but-not-extreme head of hair (Liz often went to extremes). 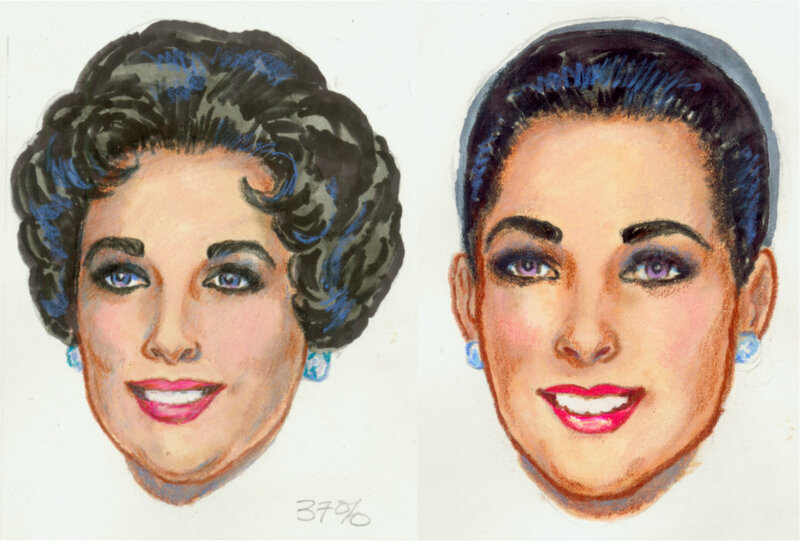 It took four attempts for me to get the right likeness, the best hair-do and to capture those oh-so-famous violet eyes. Luscious Liz is sure to inspire OPDAG artists to provide the most glamorous wardrobe ever! Liz, too mature and Liz with wig-possible sleek hair, both rejected. Liz with the right hair but not a good likeness and the final approved dress-a-doll head. This month’s coloring book fun gave me a chance to color in a splendid 64 page book I bought when it was published in 2010 (before the adult coloring book craze kicked-in) and it’s been on a shelf at home, waiting to be colored since then. Color Me Marilyn: Classic Hollywood Moments is beautifully drawn by Emanuel Emanuele depicting Marilyn moments as originally captured in many photos that recorded her legendary life and career. The coloring book is still available for $25.00-$90.00 at Amazon.com. 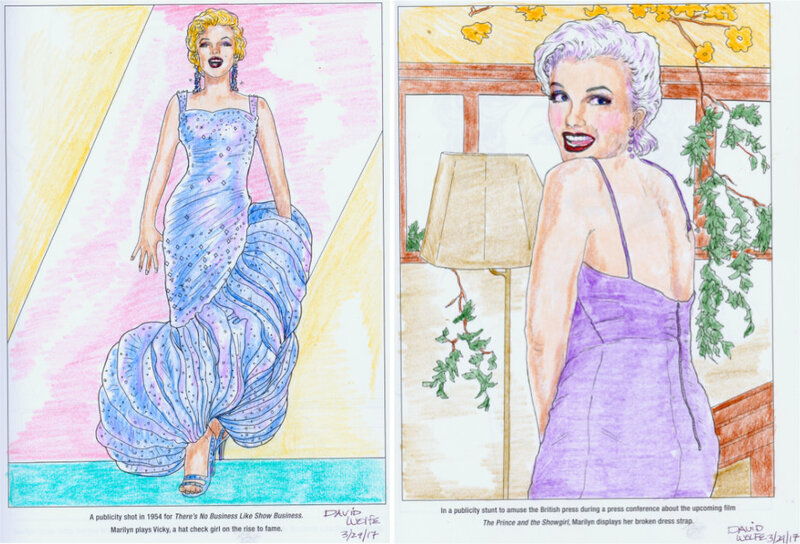 One slight disadvantage is that this quite marvelous coloring book has been printed on smooth, coated paper that doesn’t take well to crayon or colored pencil. Still, I’m pleased with my efforts…see below. 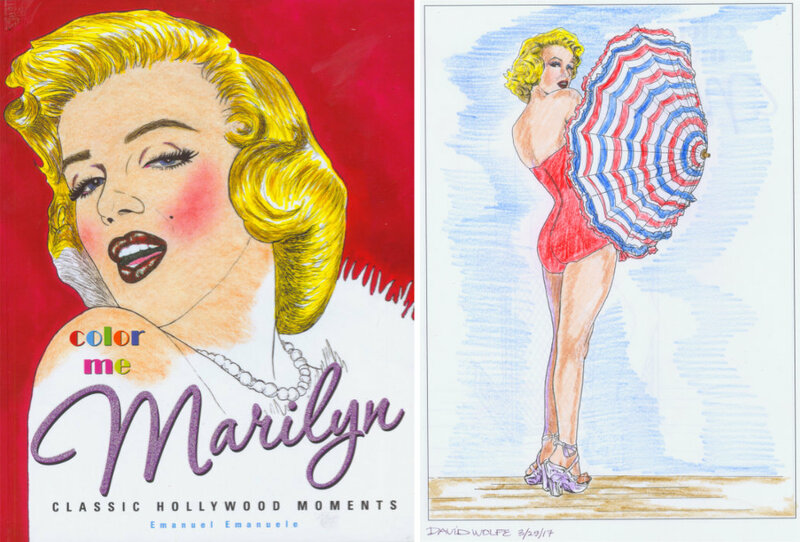 "Color Me Marilyn" cover and pin-up girl pose. Marilyn in glam gown and making the most of a wardrobe malfunction. © copyright David Wolfe. Simple theme. Powered by Blogger.